The Dog Stars is the post-apocalyptic tale of Hig, his dog Jasper, and Higâ€™s neighbour Bangley. Theyâ€™re some of the very few survivors of a devastating pandemic of flu in which Higâ€™s wife â€“ and most of the people he knew â€“ died. Hig has a Cessna aeroplane which gives him some liberation from the harsh realities of post-disaster life, but for the most part he exists side-by-side with Bangley, a black and white kind of guy with a love for guns, lots of them. Hig, Jasper and Bangley jog along together peacefully enough, barring the odd excursion or attack by other drifting and desperate survivors. Itâ€™s only when Hig begins to obsess about the possibilities of a crackly message – heard over the radio whilst out flying one day – that things seem to have the hope of changing. The amazing achievement of this book is that, although very little happens, this book kept me connected and immersed. The author writes Higâ€™s voice in a genuinely distinctive way â€“ itâ€™s sparse, disconnected, and reflects perfectly the mind and narrative voice of a survivor who has spent much of the time after such comprehensive devastation in near-aloneness. Higâ€™s relationship with Jasper â€“ more than any other â€“ is hugely emotive and touching; I was moved to tears many times during reading this book, and most of those instances related to Hig and Jasperâ€™s interactions. In some ways, Jasper forms a connection within the narrative to all that has been lost, and is central to the key points of emotional reconnection. The narrative also remains grounded as a plausible dystopian reality by focusing throughout on the differences in relating to â€˜the otherâ€™ â€“ ostensibly, it is at first only evident that Bangley has a â€˜shoot now, ask laterâ€™ policy about outsiders, but as the story progresses Hig has to take his own decisions about interactions with other survivors, with the eventual realisation that many of them will be dangerous and willing to kill first if given the chance. The pragmatic and almost mundane nature of these encounters creates an authentic context for the characters to stumble wearily through. The whole book is rather poetic, despite this gritty realism, and ends with Higâ€™s favourite poem, which feels right overall for the tone of the book. 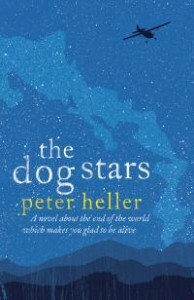 Ultimately, this is a novel about love, loss, identity outside of the â€˜packâ€™, and [re]connection in a post-apocalyptic landscape. Unlike some dystopian fictions this story manages to remain harshly authentic yet is incredibly moving and uplifting. I highly recommend it.